Ladies and gentlemen, don’t start your engines but instead fulfill your need for speed by considering this. A cheetah can accelerate from 0 to 60 miles an hour in 3 seconds. One. Two. Three and a cheetah is going full speed. When you visit Kenya, for example, we promise you that your safari vehicle even the best of them will be able accelerate from 0 to maybe 10 miles an hour in the same amount of time. Where are the best places to see cheetahs now? There are four regions of Africa where your chances are pretty good. We say pretty good because any time you’re tracking an animal that can run as fast as a cheetah in a vehicle that only dreams of moving that fast, like is true with all wildlife, there are no guarantees. However, Namibia, Botswana, South Africa and Eastern Africa (Kenya and Tanzania) all have fairly healthy populations. In Kenya, the range of the cheetah population has shrunk considerably over the years, but they still occupy 23% of their original territory. When one considers that cheetahs have been around for an estimated 4 million years, that’s actually not too bad. When cheetahs run, they use their tails like a skipper uses the rudder on a boat – making turning possible and quick. Cheetahs actually don’t run after their prey for great distances but slowly sneak up on them and will attack, typically, when they are less than twenty yards away. You do the math. A slow antelope versus a cheetah that can go from 0 to 60 in three seconds over a space of twenty yards. Well, at least it will be all over quickly one hopes. Two more fun cheetah facts – and we welcome you to share yours via Twitter and #africafactfriday. The Naboisho Conservancy in Kenya has a very healthy population of cheetahs and we recommend you consider visiting there – if you do, a portion of your trip’s costs will go directly to the conservancy and to their efforts to preserve the population there. We’re certain they’ll be quick to thank you. Last one – cheetahs can run twice as fast as an elite thoroughbred horse. Now, we’ve never seen a cheetah chase down a horse at the Kentucky Derby but it’s interesting to think that if there were cheetahs in Kentucky, the cheetah could. This isn’t a cheetah fact but it’s a very interesting opportunity for anyone who loves cheetahs and might be interested in a volunteer project working with these amazing animals. Our friends at African Impact have a great program in South Africa with lots of different options and some great pricing as well – here are more details. Roar. 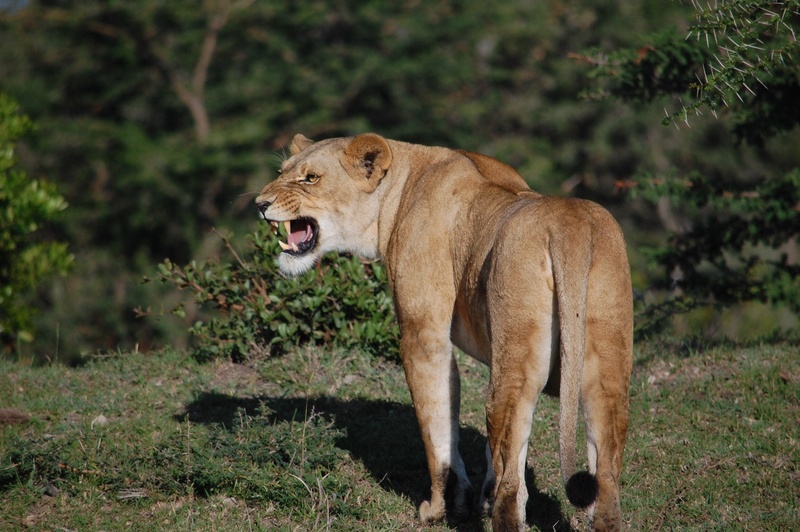 Or What’s Your Favorite Lion Fact For #africafactfriday? We love lions. We love watching lions hunt and we love watching lions sleep which is a good thing because the average lion sleeps 20 hours a day and then does a little walking around and maybe some hunting before they go back to sleep for another 20 hours. Like they say, it’s good to be the King. In honor of #africafactfriday, we brought out a few of our favorite facts about lion (like the fact that they sleep twenty hours a day) and we thought we’d share them with you. One reason that everyone loves lions more now than they used to is the Broadway musical, “The Lion King” which made Simba a household name. Simba, by the way, means lion in Swahili and that’s the primary language in Kenya which is where we highly recommend you go see lions. Now there are a lot of lions in Kenya, but the single greatest concentration of lions in Kenya that we are aware of is the 100 member pride that lives in the Naboisho Conservancy in the Mara region. This huge pride is dominated by a very large male and we highly recommend that you visit Naboisho and see for yourself. Now, one of the reasons that we know so much about that pride is due to the amazing work of the not-surprisingly-named Mara Naboisho Lion Project. While 54 million people have seen “The Lion King” as it has toured the world, a much smaller number of people have been fortunate enough to visit, volunteer and help out on this amazing project in Kenya. If you are looking for a place to volunteer and see lions, a lot of lions, we highly recommend contacting them. If you are just interested in visiting Naboisho and staying at, for example, Encounter Mara, a five star camp which was named Kenya’s Best Tented Camp, we have a special way for you to do it that the lions would shake their tails in appreciation (lions by the way are the only member of the cat family with a tasseled tail.) When you stay at Encounter Mara, Travel On The Good will make a large (i.e at least 10%) donation of the cost of your trip the the Mara Naboisho Lion Project. You win. The lions win. Everyone wins. And then you can see a group of lions like the one in the photo above, they’ll be most impressed that you know that their back teeth are called carnassals and actually work like scissors when eating raw meat. You won’t want to saw chewing in front of the pride because everyone knows that lions don’t chew their meat actually, they swallow whole chunks of it. Which could also explain the sleeping. What Do Elephants Talk About At The Watering Hole? They’re highly intelligent, communicative, and have a sense of smell that is even better than a bloodhound’s. Elephants have feelings, too. There have been numerous observations of empathetic and caring behavior exemplified by elephants, such as using their trunks to touch and give support to other elephants or to help their friends feel better by trumpeting sympathetic noises. An elephant can also detect the vocalizations of their companions seismically, with their feet. When an elephant makes a noise, an exact replica of this signal is sent separately through the ground. With their sensitive feet, elephants can detect earth tremors, thunderstorms and the hoof beats of distant animals. They know which human voices represents threats and can warn each other. Speaking of human threats, people are a huge threat to elephants in the wildlife. 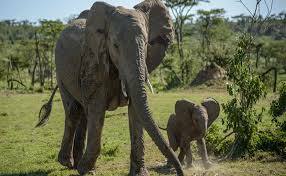 Due to poaching for the trade of ivory, the population of elephants is dropping rapidly. Individuals from local communities have turned to poaching due to increasing poverty and high rates of return from the ivory trade. Can safari tourism be more valuable to local communities than poaching? Many think so. Tourism is the second largest income generator after coffee exports in Kenya. If you want to do your part to save elephants, we suggest visiting the Mara. Book with Travel On The Good and stay at the Encounter Mara. Proceeds from your trip will benefit the Naboisho Conservancy, which supports the local community and is working tirelessly on anti-poaching efforts. Through research, education, conservation and advocacy we promote the protection and kinder treatment of elephants whereever they may be. As acknowledged experts on the natural behavior of elephants we offer insight to protect them and the authority to speak on their behalf. Check out elephantvoices.org to support and read more about these complex and wonderful animals. If you are interested in visiting the Mara and doing your part to help save elephants and save on a great deal, then be sure to check out our new offer. Right now, by booking with Travel On The Good, a couple can stay at Encounter Mara for 4 nights for only $3685. For 5 nights the price is $4310. Your trip will directly benefit the Naboisho Conservancy in the Mara and their anti-poaching efforts. If you have any questions, please contact our own elephant fanatic, Avery at avery@travelonthegood.com. Africa Travel Trends – What’s Up? Travel Pulse just posted an interesting article on the 6 hot new travel trends for Africa. We agree with them but want to add two more. With the Baby Boomers having a safari at the top of their bucket list, and they should right? We believe that you’re also going to see people come back to Africa more in the past. Why? Well, for a large number of tourists, especially Americans, they don’t fully understand the African travel experience until they’ve been there at least once. For example, travelers to the Mara in Kenya will have seen amazing pictures of safari goers out on foot in the bush – it’s not till they’ve been there do they realize that these pictures were taken inside private conservancies like the Naboisho Conservancy where the guides from camps like Encounter Mara will take you out for long walks on the private land. Nor do first time visitors realize what a difference it makes to go to Uganda and see the gorillas or how far away and how amazing a place like Namibia is from say, the Mara in Kenya. What other Africa travel trends are out there? Well, you tell us in the comments! We’d love to hear from you. There are some last minute specials now available from Travel On The Good to go to the Mara this year for the amazing migration of animals (August and September travel.) Please email james@travelonthegood.com if you are interested.